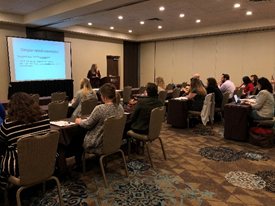 We had a great time in Austin, Texas at our HR & Employee Benefits Summit, Training & Development Summit, and Contact Center & Customer Service Summit! 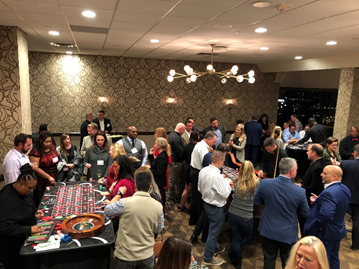 These joint events were held at the Hyatt Regency Austin on November 11 to 13, 2018, and while the weather outside was slightly chilly, inside things were heating up with great connections between our delegates and solution providers. Sunday night kicked off with a pre-event cocktail reception, where those who were either local or had arrived earlier that day could mingle and network with fellow event attendees and get excited for the next two days. The following morning, Pete Smith, author of Dare to Matter: Choosing an Untuck and Unapologetic Life of Significance, kicked off the day with his keynote on the six key ways to incorporate significance into both our personal and professional lives. The day continued with the true heart of these Forum events- the one-on-one meetings between company executives and solution providers. We had 26 solution providers present, and 59 company executives from such companies as Hulu, Texas Roadhouse, New York Life, Southwest Airlines, Honeywell, The Salvation Army, Quest, and Performance Foodservice, just to name a few. Throughout the event, there were also 13 various HR, Training, and Contact Center workshops in addition to the one-on-one meetings. These provided the opportunity for delegate executives to learn more about a given topic within that niche, learn best practices and tips, and get answers to some of their burning questions. - Building Senior Leadership Teams, which targeted the three leadership competencies organizations need to cultivate to be ready for a fast-moving future. - You Don’t Know, What You Don’t Know, Until You Know focused the difficulties HR personnel face staying up to date on HR compliance issues. - How to Attract, Manage, and Engage the Millennial Workforce, which targeted how to manage and retain a generation of employees that are often characterized as impatient and entitled. - KPI: Strength or Weakness, provided information on how to know if you’re measuring the right KPI, how to determine whether the goals appropriate, and how the future will shape how these are measured. - Authentication and Security at the Speed of Conversation, focused on how to build a voice identify platform that not only authenticates customers and protects from fraud, but also allows the building of an all new customer experience. - Resolving the Retention Riddle, focused on the most common strategies for attrition, what key things those strategies are missing, and how to take a holistic approach to get a better handle on controlling attrition. Aside from the all-important meetings and educational workshops, there was also lots of general networking and fun to be had! On the night of day 1 at the Forum Events is the staple Casino Night, which included a cocktail reception, full catered dinner (and dessert!) followed by casino games. Day 2 closed the event with additional meetings and workshops and a prize drawing for all participants. Sad you missed out? No worries, our next Forum Events in the HR, Training, and Contact Center markets are just around the corner! Our next ones will be held on April 15-16th, 2019, in Washington, DC- come join us! If you are a manager, director, or executive with decision-making power and are seeking service or product solutions, these events are a perfect opportunity to meet with solution providers and network with peers to share best practices. We hope to see you there! "Loved the concept, flow & networking. Happy to meet such like-minded HR professionals in an organized setting." "Not only was this experience great for meeting vendors but getting the chance to talk to other individuals in similar roles to me. Thank you so much for having me." "This event was like no other event I have ever been a part of. I would highly recommend attending if you have the opportunity. You receive one on one time with vendors of your choice and get the time to learn about products you might not have realized were out there." "When I was invited for this event, I wasn't quite sure what I could potentially get out of it. It turned out to be one of the most productive and informative summits that I have attended. All of the vendors were well prepared and had great products." "The summit was an effective way for busy HR Professionals to engage & learn about new products that can help improve HR services for our organization the one-on-one format allowed for a more detailed vendor-client conversation about possible solutions. I heartily endorse the summit and thank the summit team for creating such an engaging event." "Great format; was personal and informative. Easy conversation without being in a loud crowded trade show area." "This was my first event. I found it informative and I believe that there are a number of vendors that I will be partnering with in the future. I have also, through networking, begun some professional relationships that I believe will be ongoing. Thank you for this opportunity." "I liked the one-on-one meetings. Very easy format to understand vendor offerings. Event was very well organized." "Staff was very diligent to get the vendors that you request!" "This was a great opportunity to network and develop working relationships, learn more about various services and products, as well as learning from the workshops on business strategies. Thank you!" "This style event worked well for me. There was no pressure, great conversations, and excellent networking opportunities." "Fantastic opportunity to have customized meetings with potential business partners that meet the company's objectives. Great networking and relationship building." Did you miss this summit? Don't worry - we have another taking place on November 14-15, 2016 in San Francisco, CA. Click here to register. PHILADELPHIA, PA – The HR & Employee Benefits Summit hosted nearly 630 business meetings in Philadelphia on March 14-15, 2016. For executives attending the summit, it was an opportunity to connect, learn about and discuss the latest technologies and services in the industry. Industry thought leaders also hosted seminars for executive attendees, including New York Times bestselling author and Fortune 500 consultant, Daniel Schawbel. Mr. Schawbel hosted an intimate seminar to 30 of our attendees, the same seminar that he will later present to more than 3,500 people at SHRM in Washington DC. Topics included leadership, recruiting, talent management, management training, and leveraging technology in the human resources industry. 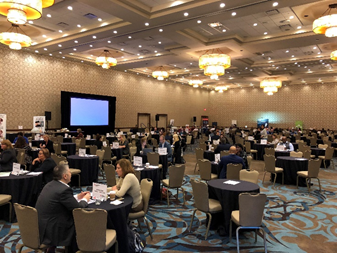 “Not only was this experience great for meeting vendors, but also for getting the chance to talk to other individuals in similar roles to me,” said the Head of Senior Recruitment from Suarez Corporation following numerous networking activities and meals. Delegate attendees connected with both vendors and peers during a gala dinner where lobster ravioli and cheesecake were both a huge hit! Later that night, attendees took to the blackjack tables for a chance to win a grand prize. On day two, everyone was back to business for more meetings and seminars. Before heading back to their offices, attendees participated in a raffle prize drawing over lunch where National Vice President of Training from Toll Brothers, Cynthiann King, took home an online one-on-one assessment from Taking Flight Learning. Other winners included Rene Persin of Hartford Funds and Patrick Paul of Anderson Center for Autism who both took home Seiko watches. Vendors who participated in the draw prizes included DeVry University, Stewart Leadership and CareerArc. Did you miss out on this summit? Don’t worry – you can participate in upcoming summits taking place in San Francisco, CA on November 14-15, 2016. For more information, contact Event Manager & VP of Business Development Shane Doherty, here. All hands rose when speaker Marc Miller asked the HR professionals in the room to raise their hands during his seminar at the HR & Employee Benefits Summit in Philadelphia, PA on March 14th, 2016. 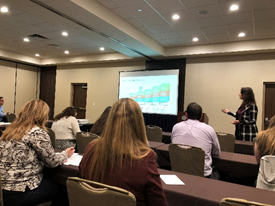 With a focus on HR technology solutions, it’s no surprise that Miller’s seminar, “‘Heroic HR’: Leveraging Technology to Help HR Move from Data Management to Information Craftmanship,” focused on the connection between human resources and the C-Suite. The common theme throughout the seminar was the importance of knowing your company. Your HR strategy must align with your company’s strategy, and the tools - most of which are technology based - should not just express data but they should also generate metrics, dashboards, models and forecasts – especially in talent management. HR executives are expected to produce integral information for the C-Suite, not just data, and in many cases HR is the first resource for CEOs during growth planning. As Miller explained, it’s imperative that the HR team crafts information and stays proactive and participatory in the executive’s needs. “HR is not ready for big data,” voiced Miller, explaining that big data does not apply to the industry in the conventional way and that for big data to be useful – HR must first get metrics within its own boundaries right. With more than 35 years experience in all aspects of technology solutions for Human Resources, Miller is an authority on Information Systems speaking at national meetings including the American Management Association (AMA), the American Society for HR Management (formerly ASPA). To contact Marc Miller directly, click here. The HR & Employee Benefits Summit and Training & Development Summit are pleased to announce a new speaker to their seminar program taking place on March 14 & 15, 2016 in Philadelphia, PA.
Jim Geier offers more than 30 years of consulting, senior management, and human resources experience in the public, private and not-for-profit sector guiding leadership teams to ensure that their business strategies pay off in the short-, mid- and long-term. He has a wealth of US and global experience in top companies across the financial services, healthcare, life sciences and chemical industries. As Founder, President and CEO of Human Capital Consulting Partners, Jim works with senior management teams, Boards of Directors and human resources executives to identify the pressing business needs, and then he develops practical and results-oriented solutions that best fit the needs of the company. Jim is known for a unique blend of keen business insight, operational and logistical savvy and successful and proactive project management with a results orientation. He understands how to ask the right questions to clarify key needs and has a range of solutions to address business and organizational issues in a way that preserves trust and credibility at all levels. His unique approach has been proven to dramatically affect the bottom line and ultimately, shareholder value. Jim is on the Board of Directors at Franklin Mint Federal Credit Union, where he has served as Vice Chairman of the Board, Co-Chair Governance Committee and Chair Human Resources Committee and Philadelphia Young Playwrights, where he serves as a President of the Board and a member of the Executive Committee. For more information on the HR & Employee Benefits Summit or Training & Development Summit, contact Event Manager Shane Doherty here. IRI specializes in measuring employee engagement throughout an organization. IRI's time-proven methodology and technology tool kit help clients transform insights from employee feedback into action plans that break down barriers to building engagement. The result is a corporate culture of high employee engagement that leads to increased performance, individually and collectively, and translates directly into better business performance scorecards. An event built around your needs - The HR & Employee Benefits Summit offers a personalized itinerary based on your sourcing needs. Meet one-on-one for private meetings with experts who can advise you and help form an informed plan for your company. Attend one-on-one meetings, learn about new best practices and technologies in the seminar program and connect with other senior-level executives during numerous networking meals and after hours. After her success with past audiences, Lisa Rueth is returning to the HR & Employee Benefits Summit and Training & Development Summit in Philadelphia to shed light on leadership and organizational development. Lisa is CEO of Cultivate Leadership (formerly Trinity Solutions), a consulting firm dedicated to Leadership Science, OD Consultant and Executive Coaching. With more than 20 years of experience, Lisa left her role as an Executive in Telecom and Manufacturing 13 years ago to dedicate her career to helping organizations with the mechanics of leadership, human performance and systems of collaboration. Cultivate Leadership specializes in helping leadership teams through accurate diagnosis, culture engineering, leadership development, team building, change management, executive coaching and strategic planning. Lisa studied Applied Leadership and Organizational Psychology at the Ken Blanchard School of Business and did graduate work in Authentic Leadership at Naropa University. She also holds many professional certifications such as Certified Customer experience Engineer, Six Sigma Black Belt, Kaizen Facilitator and Certified Workplace Wellness Coach. For more information or to register for the HR & Employee Benefits Summit or Training & Development Summit, contact Event Manager Shane Doherty at shane.doherty@forumevents.com. The HR & Employee Benefits Summit taking place in Philadelphia, PA on March 14 & 15, 2016 is pleased to announce award-winning author and recognized columnist, Dan Schawbel, will be speaking. Schawbel is the New York Times bestselling author of Promote Yourself & Me 2.0, partner and research director at Future Workplace, founder of Millennial Branding & WorkplaceTrends.com, Inc. Magazine & Forbes Magazine 30 Under 30, and a TIME / Forbes Columnist. He has spoken at more than one hundred events and has conducted 27 primary research studies focused on workplace trends and has interviewed more than 1,500 people to date. In the next five years, 20 million baby boomers will retire, leaving institutions worldwide without leadership positions filled. Almost half of companies haven't even analyzed the impact of this impeding trend on their workforce and fewer than one fourth of companies have made succession planning a priority. To make matters worse, millenials are switching companies every two years. In this discussion, you will hear about the top ways you can engage with the next generation of leaders so you can retain and fill your executive level positions, view groundbreaking new global research that will instruct you how to create the right leadership, training and succession planning programs that support future leaders, and listen to case studies from forward-thinking companies on how to create next generation corporate leadership programs. Restless Gen-Y workers - often faced with unfulfilling or static positions - frequently leave their posts within two years. But as Millennials become the dominant generation in the office - set to represent 75 percent of the entire workforce by 2025 - companies must learn to keep them engaged and motivated by creating more opportunities for them. How can corporations retain young workers? In this presentation geared toward HR leaders and managers, speaker Dan Schawbel shares advice, research, case studies (including Sodexo, Ernst & Young, Intel, DreamWorks, and more), and examples to illustrate how employers can both attract and manage Gen-Y workers to allow them to rise up to leadership positions instead of leaving for other opportunities. The HR & Employee Benefits Summit is the most productive and complimentary networking event for senior-level HR executives. Unlike a traditional convention or trade show, this summit introduces executives to solution providers during one-on-one targeted meetings. All meetings are pre-arranged and are strategically coordinated based on upcoming projects and interests. A seminar program at the summit offers educational opportunities and peer-to-peer networking is incorporated over meals and receptions. For more information on the HR & Employee Benefits Summit, click here. Complimentary registration is available for qualifying senior-level executives. Are Employees Reaping the Benefits? Paternity Leave? P.T.O. ?